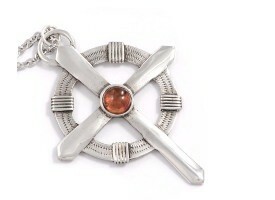 A rare and limited collection of hand finished / decorated 925 quality Dutch and Sterling Silver Art Nouveau Pendants and Necklaces the designs of which are inspired by, and taken from the original 'Design Masters / Templates' of 'Royal Van Kempen and Begeer'. 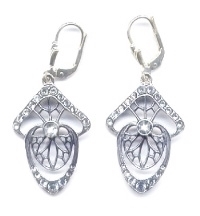 Art Nouveau 'Diana' Pendants with Pearl, with a skin toned part frosted look over Silver. 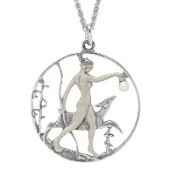 Art Nouveau Male Wood Nymph Necklace with a skin toned part frosted look over Silver and with Single hanging Pearl, and decorated by hand with Champleve enamelling. 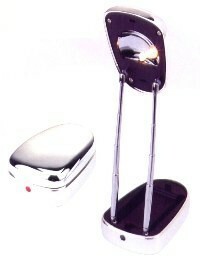 The design is by: Georges Brunet (1847-1904). 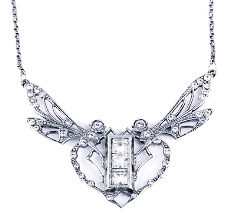 Art Nouveau Double Dragonfly necklace forming the shape of a Heart and set with multiple Swarovski Crystals. 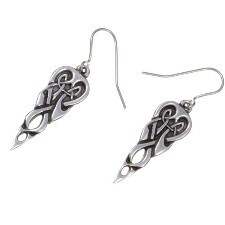 This is a typical Art Nouveau design by the French artist Rene Lalique (1860-1945). 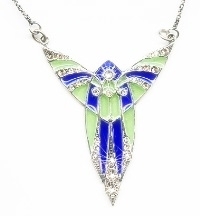 It is also called "Dragonfly Wedding"
Art Nouveau Double Dragonfly necklace forming the shape of a Heart, set with multiple Swarovski Crystals and decorated by hand with 'Plique a Jour' enamelling. 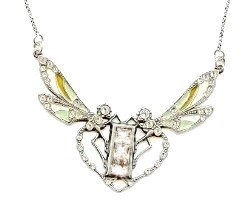 Art Nouveau Male Fairy Necklaces with a skin toned part frosted look over Silver, with double outstretched patterned silver wings set with Swarovski crystals. 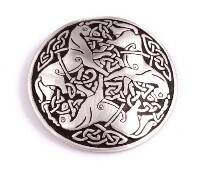 Art Nouveau Male Fairy Necklaces with double oustretched patterned silver wings, with a skin toned part frosted look over Silver and decorated by hand with Champleve enamelling. 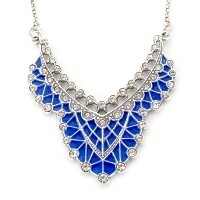 The design is by: René Lalique (1860-1945). 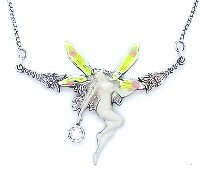 Art Nouveau Necklaces of double open slim winged fairy in an ascending pose. clasping a Pearl and with a skin toned part frosted look over Silver. 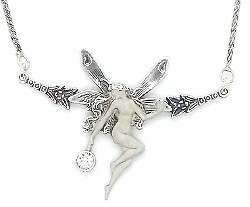 Art Nouveau Necklaces of double open slim winged fairy in an ascending pose. 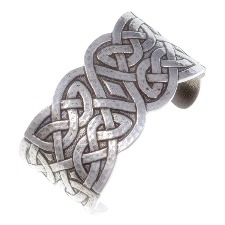 clasping a Swarovski Crystal, and with a skin toned part frosted look over Silver. 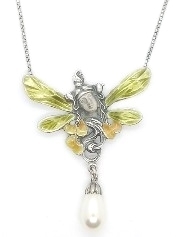 Art Nouveau Necklaces of double open slim winged fairy with a skin toned part frosted look over Silver, in an ascending pose, clasping a Swarovski Crystal and decorated by hand with Champleve enamelling. 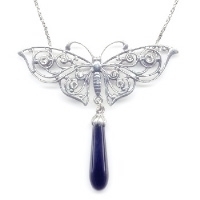 Art Nouveau Butterfly Necklaces with scroll framed open wings set with Swarovski Crystals, and from the main body of which hangs an elongated onyx drop. 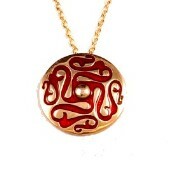 Art Nouveau Necklaces with Pearls, with a skin toned part frosted look over Silver. 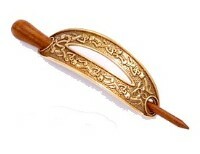 The Head depicts an Art Nouveau lady with a frosted silver face and flowing hair. She is based on the French actress Sarah Bernhardt. A typical piece of Alphonse Mucha (1860 - 1939) jewellery. 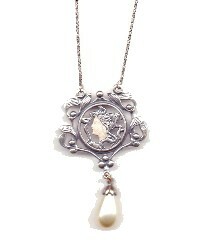 Art Nouveau Necklace of prone position Lady clasping a single Pearl. clasping a Swarovski Crystal, with a skin toned part frosted look over Silver. 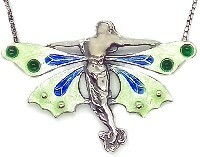 Art Nouveau Pendants of double open winged fairy in an ascending pose, with a skin toned part frosted look over Silver. 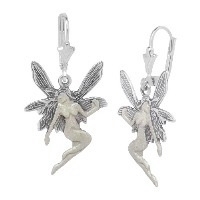 Length; approx 17" - 18"
Art Nouveau Fairy Pendants of double open broad winged fairy nymph in a rising pose, with a skin toned part frosted look over Silver.